Here is a clip out of the new micro news. This will be all new tooling from the ground up with the added bonus of injection molded M1 tanks to fit on the flats. We will also have chain tie downs either injection molded or photo etched. This was announced at the Sunday breakfast but I understand the even wasn't well attended as usual. Though I would give you guys a look. The DODX flats look great Joe - I love the inclusion of the tanks and the tie-down chains. I hope these are very popular for you. I'm defiantly onboard for the booster rocket set, these look great! Ohhh....Nuke flasks are a great idea! Sometimes, DODX flats roll across the CSX Hanover Subdivsion, coming off of G&W YorkRail from BAE Systems in York, but they carry M88 Tank Recovery vehicles. Just so happens someone on Shapeways has a 1/144 model of the M88. Wonder if they will rescale it. Wow, and the hits just keep on coming. Very nice announcement for n-scale. Would be neat to see in Z too but I think I know better. The Navy cars are captive services? There is only a few places were the navy would move missiles to ships and they all have docks. Is the 4-axle flatcar a DODX design. or is it a commercial design found on other roads? 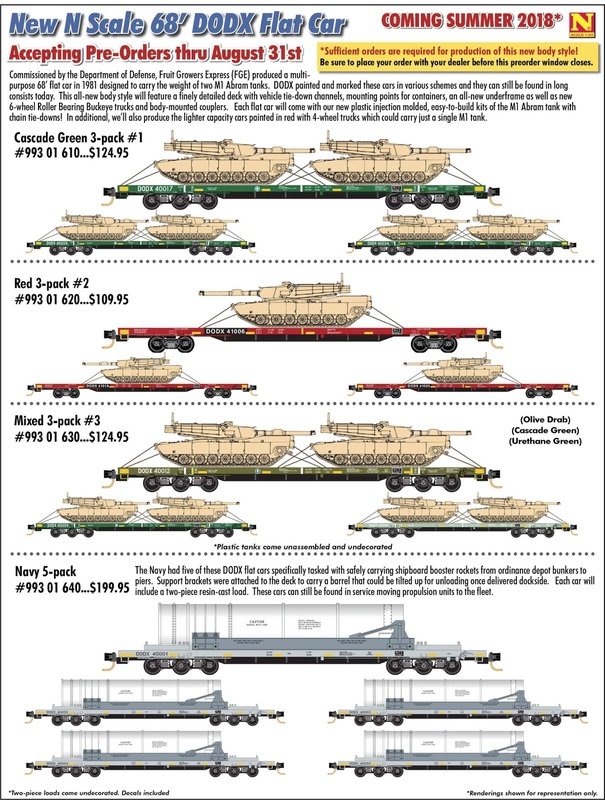 I assume the 6-axle version is unique to the DOD, since it was commissioned by them. Also I do not remember seeing any loads like Set #2 with the barrels pointing forward.